Two bills that would strengthen education and awareness of the growing number of people bicycling in Illinois passed out of committee in Springfield on Tuesday. One bill would add the Dutch Reach method to Illinois’ Rules of the Road manual and add bike safety questions to the state driver’s license exam. 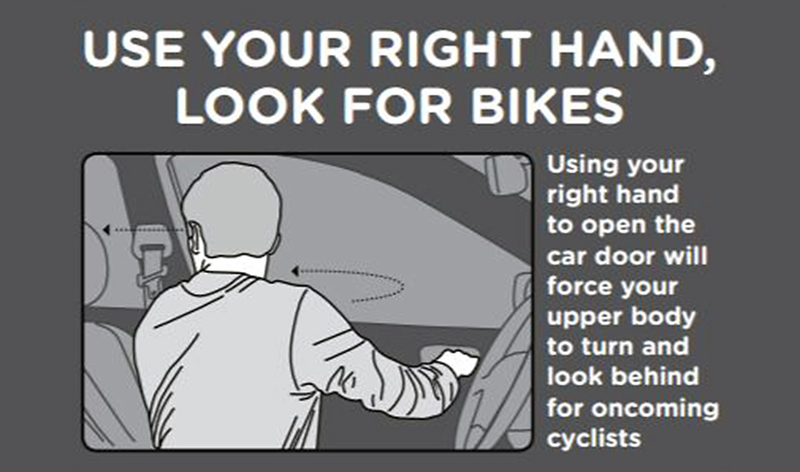 The Dutch Reach method encourages drivers and passengers to use their far hand and reach across their body to open car doors after parallel parking, forcing people to look back for approaching cyclists and other traffic before exiting the car. Research shows the Dutch Reach makes drivers and passengers more aware of approaching cyclists, helping prevent crashes and save lives. The bill (House Bill 5143) now advances to the full House. It’s co-sponsored by a bipartisan group of 20 legislators. Illinois Department of Transportation (IDOT) data shows dooring crashes are on the rise across the state, especially in urban areas. In 2015, there were more than 300 reported dooring crashes in Chicago alone – a 50 percent increase over the previous year. Getting doored is never too far from the mind of people riding bikes in the Chicago region. This bill is a good step towards reforming state policy to better reflect the needs and safety of all road users. For months, Rep. Mah, Ride Illinois, and Active Trans have been working collaboratively with the Secretary of State on revamping the road manual and exam’s bicycle safety content for drivers and bike riders, including adding the Dutch Reach. See more background on HB 5143. Another safety bill (House Bill 4799) that would make biking and walking education a requirement in Illinois schools also passed out of committee on Tuesday. The Bike Walk Education in Schools Act clarifies the existing traffic safety K-8 school curriculum requirement to specifically include biking and walking safety. Illinois crash data shows nearly five children are hit by drivers every day while walking or biking within one block of a school. See more background on HB4799. The pool of questions for the Illinois driver’s license exam currently doesn’t include any questions about the Dutch Reach method or any other bike safety topics. The bill directs the Secretary of State to consider adding multiple questions, including one about the Dutch Reach method. Join our advocacy alert list for more updates and opportunities to voice your support for these bills as the legislative session continues in Springfield.